0900hrs - 1100hrs Willow Warblers thinned out now to the norm. Maybe one or two more Chiffchaffs that norm. In Dalton Crags deforested thought I heard Lesser Whitethroat, but not clear enough to confirm as yet. Searched wide today and found only two single Wheatear. One on the wall at the bottom of the Gully and one at the top Southern corner, both on wall and then on anthills etc. Had four calling Lesser Redpolls going through to their NW. No Tree Pipits again today. 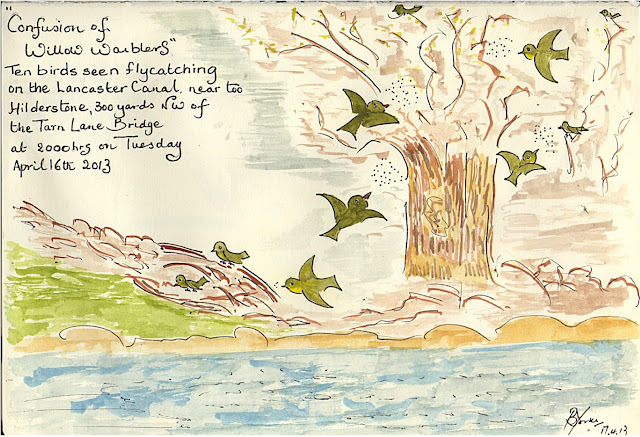 Went around the East side of Plain Quarry but still no Garden Warblers, but probably will be another week to 10 days. 0900hrs-1100hrs A massive fall of Willows Warblers during the night, settled in for now just in lower Dalton Crags. Probably a score or more with at least ten opening into song at the same time. I guess when this happens you know for a fact you have some serious quantity of birds present. 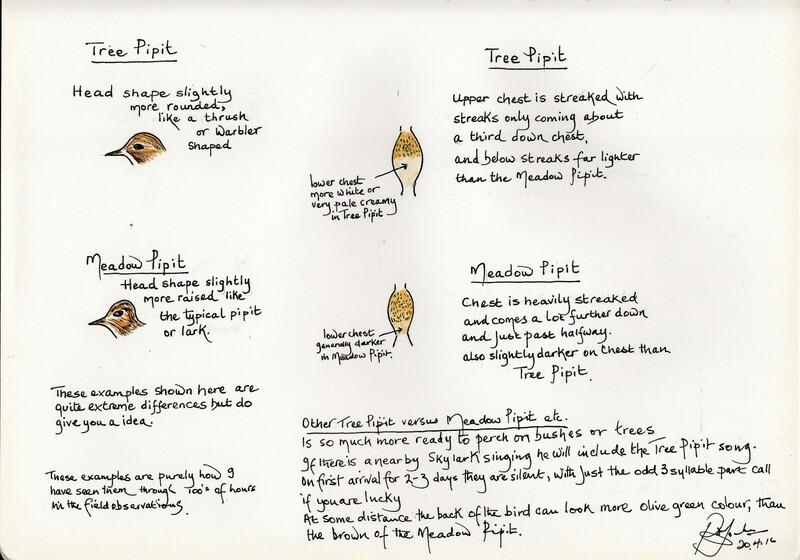 Never saw or heard our Tree Pipits, they must be in hiding! But what I did see was the first confirmed return of 3 Northern Greenland Wheatear (leucorhoa). One on the floor and two believe it or not! high in a 15ft solitary wind blown tree. I think this is probably only about the 5th time I have seem them sit high in tall trees. Everything ticked the boxes for leucorhoa's - so its just spot on with the dates to see them coming through now on a regular daily basis over the next fortnight. Also had a pair of Linnets calling and back on territory. Still waiting for our Lesser Whitethroats and in about ten days time we will hopefully see the return of our CUCKOOS in upper Dalton Crags and maybe also our fabulous SWIFTS screeming through our Village. Today was another special day with such beautiful weather, but just as special for me was the arrival of three Tree Pipits (possibly more!) which were almost silent, I watched them for over an hour and occasionally they would leave the ground to fly up into nearby trees, then from trees to lower lying bushes and so on. Just now and again you would just sparingly hear maybe three notes of their regular descending crescendo's. They seem so much lighter on their chest and with less streaking in comparison to their cousins (Meadow Pipits), they seem to have a more yellowish underside and more olive green to their back. The head feature is always a favourite to help me distinguish. I have noticed over the years that they seem to be almost silent for the first three or four days of their arrival, not singing straight away. Odd Swallows crossing the Crags in a North West direction, overhead Siskin and Redpoll heard. No Wheatears present today. Robert had 2 singing Tree Pipits over on Burton Fell on 14th April and they were still present on the 19th April. Also he recorded Common Redstart with one on the Common on the 14th April and one on Burton Fell on 19th April. Large influx of Swallows on the 14th April 2016. Well it started out with a not so nice! let me try and explain. I was watching a Brimstone butterfly coming out of Slape Lane and it turned the corner into Vicarage Lane, at the same time I saw this squadron leader coming "hell for leather" weaving in and out of the lane at about one metre high and with superfast qualities, yes it was a male Sparrowhawk and just before it reached me veered off high and causing havoc with a thrush which had been happy resting up on the nearby telephone wires. Down into a garden and it managed to collar some poor unsuspecting finch or small bird, which I could just see in its talons has it made off with weighted down flight. Not a sound was made from its victim. Going further along Slape and just to the back of the property Browside it was great to hear "Slap" has returned safely and could be heard Chiffchaffing away. Also the Blackcap has returned and giving not its best, but probably its second best scratchy Blackbirdy warble! Lots of Peacocks flying today counting no less than a dozen both on Slape, and near Clawthorpe Old Lime Kiln and chasing one another in Lancelot as well. Also saw a single Small Tortoiseshell and had a further beautiful yellow ghostly Brimstone whilst in Lancelot (thats two Brimstones today!). Lots of flowers adding colour with Red Campions, Stitchworts, Celandines, Bluebells - It looks thin on the ground in Bluebell Wood this year and from what I have already seen maybe one of those poor years to come. Also another Blackcap has returned on Slape at the crossroads which goes off to take Clawthorpe or Vicarage Lane directions. Also a couple of Willow Warblers singing away from near enough the same spot. All returning to their regular haunts. Also Wood Anemone, Wild Strawberry, Primrose, Ground Ivy, Dog Violets. On way out I noticed that at least one Swallow had returned to Russell Farm in Dalton hamlet. All Chiffchaffs in song and there must have been a very large fall of Willow Warblers in and around Plain Quarry and lower Dalton Crags with at least a score or so in song. The odd Swallow heading North, but could have been so easily missed with it winding across the Crags but only a metre or so from the ground, obviously thats the place the insects must have been! Just the odd Wheatear on the walls close to the Gulley bottom, I couldnt help but wonder if this was the same lonesome bird I had a couple of days ago which was almost in the same spot! Several Meadow Pipits rising up when dogs where seen chasing around. A lovely sunny morning which looks very much like it will only get warmer - blues skies with odd distant clouds on the horizon. First returning BLACKCAP at Plain Quarry, all Willow Warblers now returned to Plain Quarry and Dalton Crags areas. Went up Dalton but no Wheatear showing today, Skylarks not singing. First showing of wild Dog Violets throughout Dalton. Earlier SWALLOWS seemed to have come in great numbers over the past two days and seen in most destinations this morning with birds back on territory at Green Dragon Farm, Burton, Greenland's Village Farm, and Borwick and in the skies over Carnforth. It became obvious straight away that more Willow Warblers had arrived with a count today of at least five singing birds in Lower Dalton areas. Also the Chiffchaffs remain at three singing birds in or around the Plain Quarry area. Only 7 (3,3,1) Meadow Pipits heading to the NW. Checking out the wall area in Dalton (deforested/upper) at first I thought I had a Wheatear but sadly could not confirm because it was eclipsed by shadow. But later has I came back down I looked across to the walls and sure enough a Wheatear was sat there and very upright etc. For now I don't want to confirm either way (eg Oenanthe or Leucorrhoa), but would suspect it was a Northern Greenland Wheatear. Its bang on for a early date they will be coming in over the next few days in their little groups. They will be seen clearly when they are either feeding up on or closeby "Wheatear Plain" or across and on the bottom side of "The Gully" or they might just be perched on the South side limestone walls. Every years Dalton deforested produce birds, in fact once they start coming through most days will have small parties of this little beauty, sometimes just 3 or 4 but can be up to mid teens. When they arrive they will stay for a couple of days (3 at the most) whilst they take on food before continuing their journey through to either Iceland, The Faroes or Greenland. The arrive in the night (for early morning observation) and will leave by the night, sometimes you can have two groups where one party is remaining but on most dates the earlier parties will have left and been replaced by others. Also the Burton Swift Bird Study group site has started up again. Please click here to check out the Swifts. As I write (20th March), we have been under high pressure with the weather for several days, and I have noticed that the bird migration has almost come to a halt with very few birds passing through, although these beautiful sunny days you could be forgiven for thinking lots of birds should be passing through Burton. So any day now I would expect things to change if the forecasters have got it right. 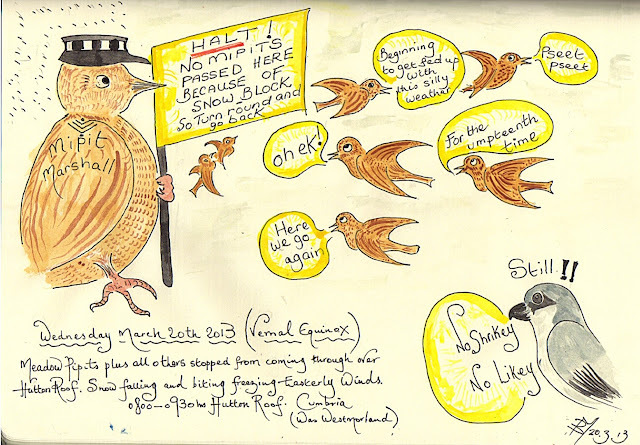 The last week of March can be very interesting having in the past had early Swallows on Hutton Roof Common, and arrivals of the Chiffchaffs in Thornleigh and every chance of a Wheatears sat on the walls of Dalton Crags (deforested). On March 15th over Dalton Crags I was treated to a very rare sighting of the spirit of the “Green Woodpecker” (see photo below). Seriously the sky was filled with “Lenticular Clouds” which eventually became lots of various shaped flying saucers. On my way back and reaching the Plain Quarry Car Park I was treated to a very early Small Tortoiseshell Butterfly hawking the area. 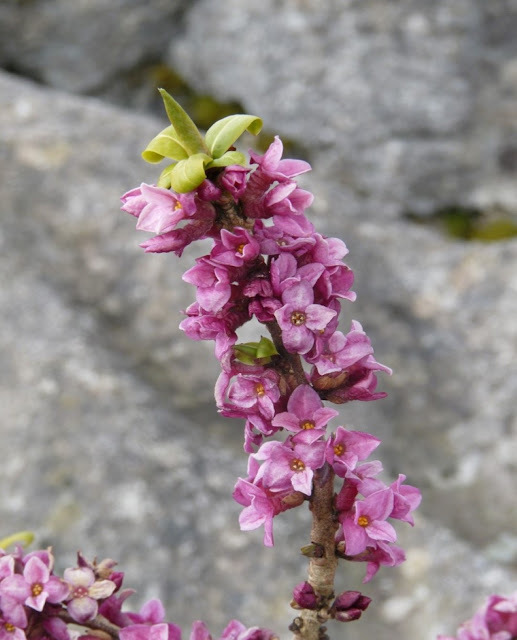 On St. Patrick’s Day (March 17th) I went over to the Park Side of Hutton Roof to check out our treasured Daphne Mezereone, that sweet smelling flower. Sure enough some of the flowers were open but the majority of the plant were still in bud and needed another week at least before you saw their full beauty. Other early flora included the Celandines and quite a few primroses coming through. I was told and shown recent photos of the Glow Worm larvae being found on Farleton Fell (early March). It also later transpired that a sighting of the actual Glow Worm beetle was seen on Dalton Crags (upper) back in 2011. Far too early yet, but must try and locate around the June time. Will I be able to stay up long enough to allow this is another matter!! I always reckon that April is probably the most exciting month for the birds with the arrivals of the small warblers including the Willow Warblers, Blackcaps, Lesser Whitethroats and what about our Dalton specials the beautiful Tree Pipits with their sort of descending song (can’t wait!). Other rare birds calling in and passing through our area will include the Northern Greenland Wheatears which again make their grouped presence known on Dalton Crags (upper). It has been known for the Cuckoo to appear during the last week of April although normally you would expect to hear the bird anytime from the 1st of May. By the time you read this I would expect the Swifts to be leaving their wintering quarters to make the long perilous journey back to us, what could be nicer than hearing those little black beauties making their presence known with their “screaming” as they fly above Main Street in little squadrons. We are so privileged to have these magnificent birds on our very own doorstep. A new Willow Warbler has arrived so we now have two in lower Dalton Crags and the one up by NW of the Trig . Been up on most days of the week but little to note with just odd Meadow Pipits being recording going through to the NW - disappointing with say 2 - 5 over one hour. All three Chiffchaffs have returned to Plain Quarry (8th April) thats Craig, Craggy and Ray all viewed and calling. Also on the same day saw our first returning Willow Warbler called "Willow" in Lower Dalton Crags, and another one was recorded yesterday (9th April) singing with little crescendo but more of a "houwhit" contact call from about 30 yards NW of the Trig, so thats slap bang on its regular territory. Other than this very little on offer at the moment. Anyday now Blackcaps and Tree Pipits! Meadow Pipits on the move 42 birds going NW between 0930hrs and 1030hrs, best party 7, but mainly pairs or singles. Green Woodpeckers (3) were very noisy this morning. Have had odd Siskin calling down in the bottom of Dalton Crags over the past few days, also occasional Redpoll. I was reliably informed that the Meadow Pipit true migration had started yesterday (Monday), with quite a lot of birds were seen coming over the Heysham areas. Today I had about 26 going over Hutton Roof mainly in singles but did have one group of 6 all NW. Also Robert Ashworth from Kendal was up looking around HR for most of the day and he also had a further 15 birds heading NW. Also parties of Song Thrush in Dalton upper. I would have thought these had to be Continentals calling in and will probably have dispersed over the next 24 hours. 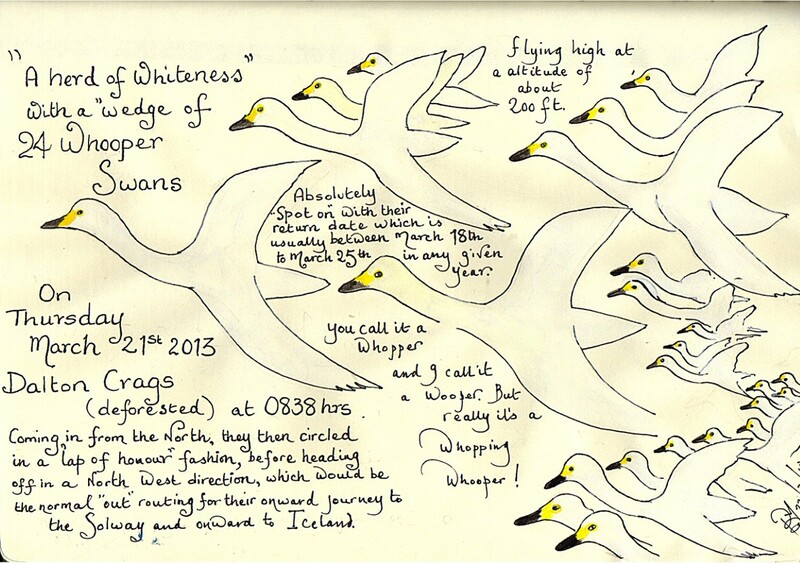 Had this on 21st March 2013 - "A Herd of Whiteness"
Thank you to Fylde Naturalist Society for a very enjoyable evening. The bird migration was non-existent with no Larks crossing, Mipits or for that matter nothing else! The saving grace with the birds was a party of 40 GreyLag Geese flying over our house East to West at 0800hrs. Besides the birds I was heading over to the special place hoping to see the Daphne Mezereone and sure enough I was not dissapointed. No good going there with a blocked up nose! You have to smell these plants to believe it absolutely stunning!.